I have been doing consulting for many years. For the past few years my desktop of choice has been Mint Linux. Both my wife and I work almost exclusively on our Linux machines. I have been looking for a Linux friendly client contact and invoicing alternative for a while. I have been torn between writing my own solution vs finding and using an existing one. One alternative I found is Sliced Invoices a WordPress Plug-in from Melbourne Australia that adds invoice related features to WordPress. Like most WordPress plugins, Sliced Invoices is opensource and free to use. There are a few paid extras that might be useful but the basic Sliced Invoices plugin does a lot. Quotes and Invoices are added to WordPress much as you would a Page or Post. You create an Invoice by choosing Add New Invoice, filling in information, then click on the publish button to publish it. Once the invoice (or Quote) are published the client can be sent a link to view the invoice or quote. The setup for Sliced Invoices includes settings to allow defining standard billing items and allow payment to be received via PayPal. There are also options to allow other payment options to be included in the published Invoice. There are three nice looking template options for the Invoices. If you want to include a graphic logo there is an option for uploading that. There are also clear instructions to get you started if you need to customize the look of the invoice or Quote. Printing an invoice. Since the invoice is just a customized WordPress page, and the Chrome web browser has a nice print to PDF feature, I tried to print using that. It worked but some of the formatting was a bit off. The Invoice number and summery information table was between the To and from addresses. The Invoice sample above is the result of a simple customization to format the Invoice to print better using the Chrome PDF print option. One of the paid extras from Sliced Invoices activates a button to export the invoice or quote as a Pdf. Presumably, with the print to PDF option formatting differences between online viewing and printed will not be a problem. The standard WordPress user feature is used for client management. The plug-in adds a new section for Sliced Invoice Client information. By adding a Business/Client Name you flag the user as a Client. 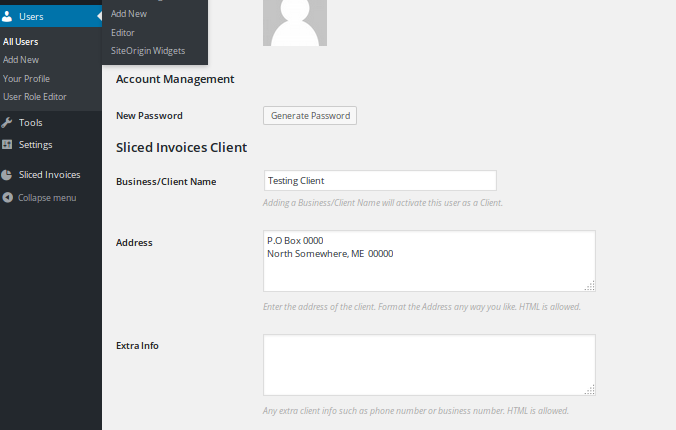 Any User with something in the Business/Client Name shows up on the Client list can be used in a Quote or Invoice. Once an Invoice has been created it appears on the Invoices page for the WordPress admin user to see. This view can be filtered by Date, Client, or Payment status and the list can be exported as a CSV for use outside WordPress. 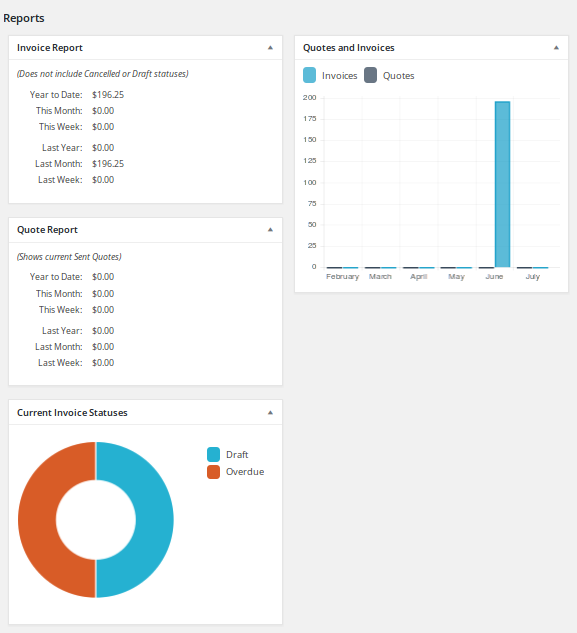 And to top things off, there are some basic dashboard reports included. 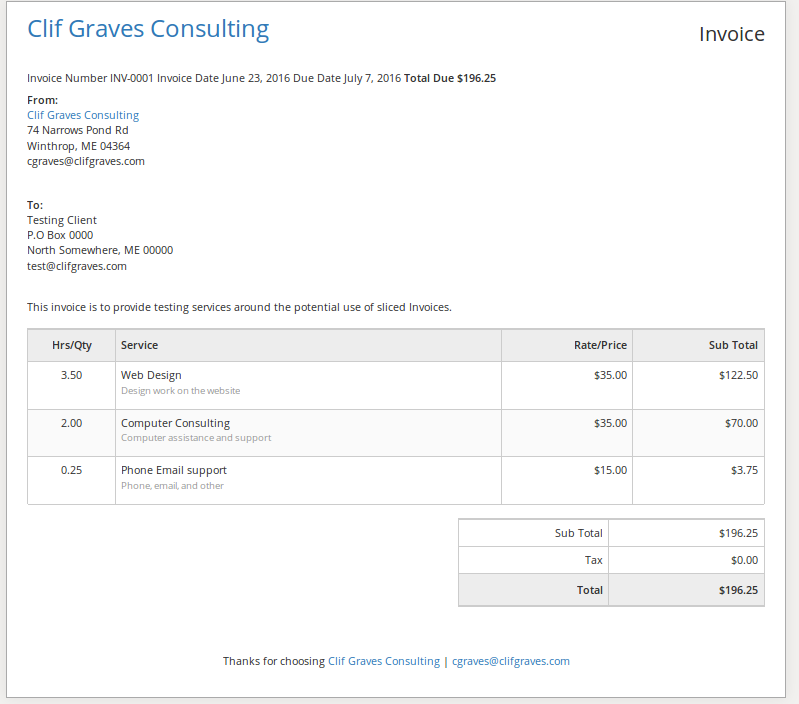 The plugin adds invoice and client management to WordPress. If you add it to your exiting WordPress web site that will put your client and Invoice information on the web. The default templates for Invoices and Quotes have the Robots noindex, nofollow line so well behaved web crawlers should not add those invoice or quote pages to their search engine results. WordPress itself has a good security record. Sliced Invoices also has a paid extra that says it will “Secure your invoices and only allow access to people who have been sent a secure link.” Probability a good idea and worth the $15.00. A simple design with lots of functionality. Easy to configure. 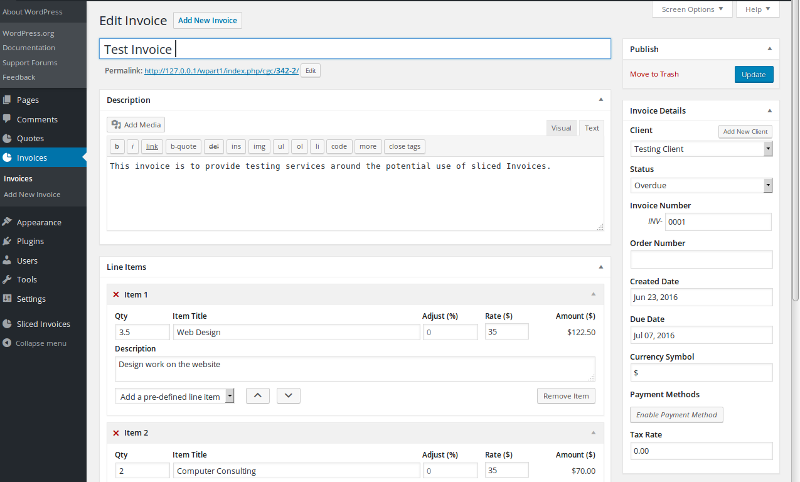 Invoice and client information is stored in the standard WordPress tables. Adding invoice data will increase the database size so if you have a large site already, have a lot of clients, and your hosting account has a database size limit that might be a consideration. The actual data added in an invoice or client user setup is very small and for most uses exceeding the database size limit will not be an issue. The export to csv function can be used to backup basic invoice information. (And you should be backing up data regularly). There is no matching feature to backup client address information. Backing up the whole WordPress database should also include this information but mixed in with other WordPress data. About actual cost. An individual consultant may well find all that they need in the free plug-in. There are currently seven extra cost add-ons to Sliced Invoices. These can be purchased individually or as bundles. Depending on how the plug-in is used you will probably want to consider some of the extras. Final thought. While it is not intended for this use, a small foundation or non-profit might well be able to use this to manage membership and donations. It does not have all the features of a fund-raising database but with some tweaking and creativity it could work. And yes, this may well be the solution I was looking for and I will, at least for now, be using Sliced Invoices to prepare my quotes and invoices.